OK, OK … I lied! IKEA is really an acronym comprising the initials and location of the founder of IKEA – Ingvar Kamprad; Elmtaryd (the farm where he grew up) and Agunnaryd (his hometown in southern Sweden). The company is the world’s largest furniture retailer, with stores in many countries, including Spain. I wanted to pop along to IKEA to pick up some photo frames for a forthcoming Art and Photography Exhibition in Torre del Mar, where I will be displaying some of my photos in June. 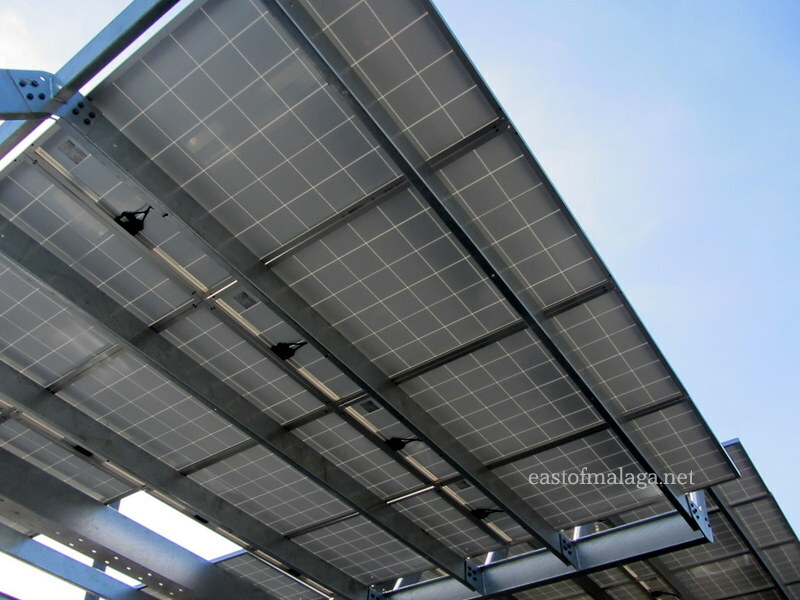 I haven’t visited my nearest store in Málaga for almost a year, but since my last visit some rather excellent solar panels have been erected as sunshades for cars parked on the 1400-space free car park. 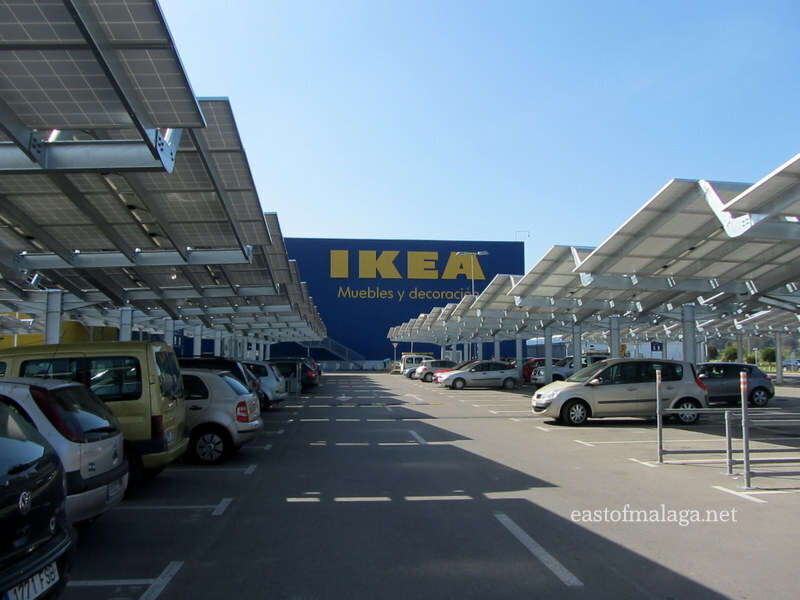 IKEA has invested €4.6 million installing solar panels not only on the car-park sunshades, but also on the roof of the Málaga store, which will produce 2,821 MWh per year – 64 per cent of the amount of energy the store used in 2012. Did you know that the IKEA logo is blue and yellow to reflect the colours of the Swedish flag? Well you do now! So, if you’ve recently moved to the Málaga area, and are looking for somewhere familiar to buy your stuff – this might be the place for you! 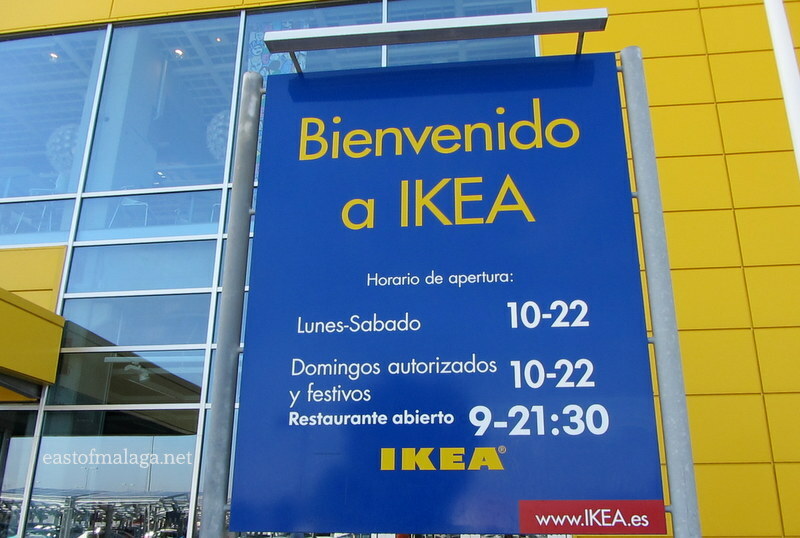 The Málaga store has the usual frustrating one-way, anti-clockwise layout, typical of every IKEA I´ve ever been in, whereby you have to walk around the whole store (and it´s a long way) to get to the exit – unless you spot the craftily concealed short-cuts. 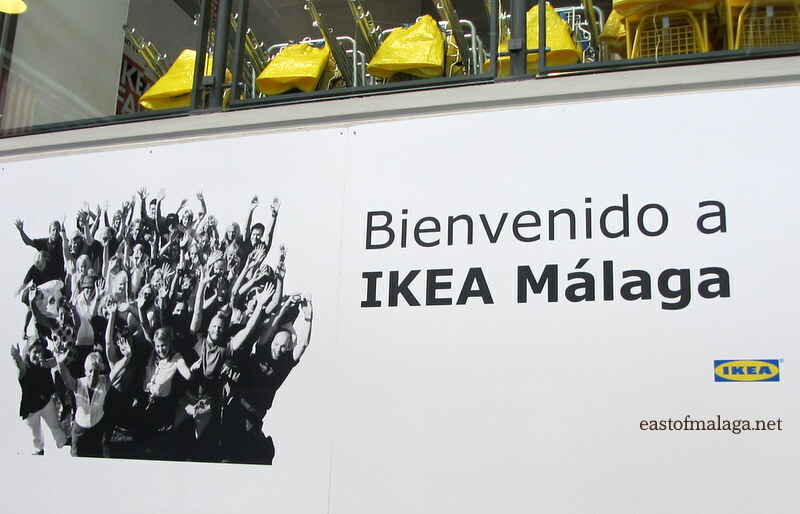 IKEA is situated in the Bahia Azul commercial area near Plaza Mayor. If you know where Málaga airport is – well, it´s close by, just off the same road – MA-21 at Exit 2. Do you have a degree in IKEA self-assembly furniture? I know I don’t! This entry was tagged Andalucía, cost of living, Europe, furniture, Ikea, lifestyle, Malaga, Spain. Bookmark the permalink. Maureen and I have spent so many hours walking the route in IKEA Malaga, know all the various cut- thoughts and have purchased so much that often it has had to be delivered and assembled. I do enjoy assembling it myself though. Not like the old MFI when you never had the correct number of screws and fixings etc. We recently received a catalogue in English and a €5 discount voucher. Thanks for the education! I did not know this! My kids love IKEA : ) Prices are just perfect too. 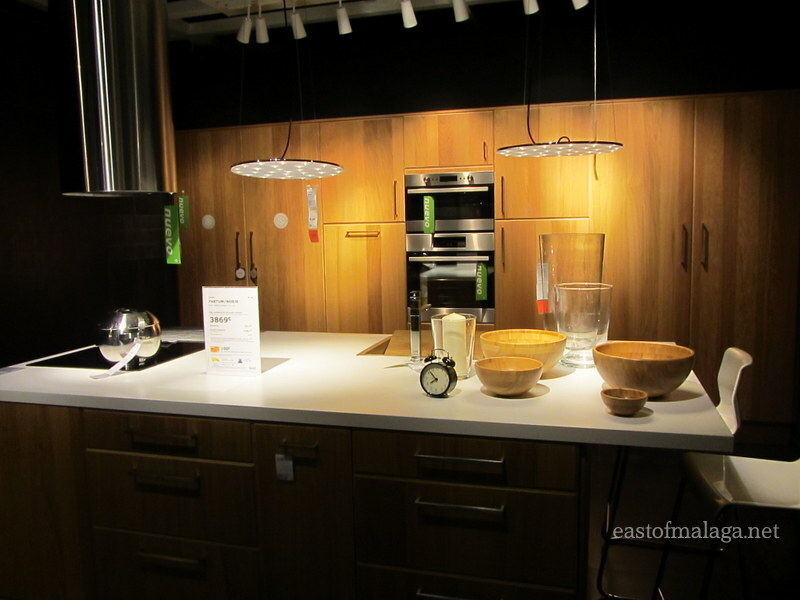 Ikea does have a lot of stylish furnitures. Oh I LURRRVE the FOOD at Ikea! Yes. I like to go there to get yummy northern food that we can’t get here in Spain, like pies! I try not to pop into the store however, because it is such a MONEY TRAP haha! Usually can’t resist, though, and the prices are so good. I often pick up a few unplanned bits and pieces, too! 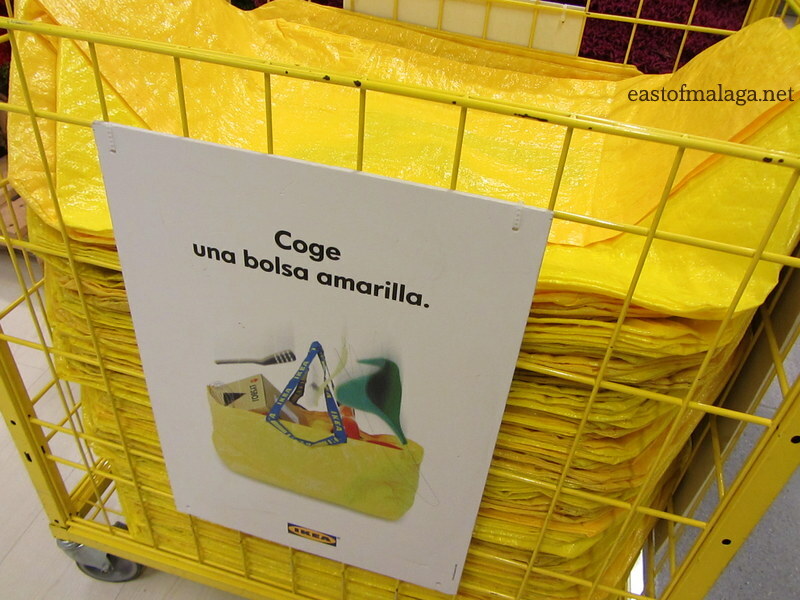 I went to the Ikea in Madrid once or twice. It was a day long excursion because it was soooo far from the center of Madrid on the metro. And from the metro it was a good ten minute walk! One of my roommates once ordered a desk for her room and attempted to put it together. She never did put it together quite the right way–something was always falling off of it and the plastic part of her chair was always popping off the metal hinges. Basically a piece of garbage. We were very giddy when we dismantled it and left all the pieces in the street for the garbage men to pick up! I understand there is public transport (well, buses) to the area where the Malaga IKEA is, but it is far more suited to getting there by car, positioned as it is by the side of/between three motorways. I think the very size of the stores make it impractical for them to be placed in town or city centres. Those solar panels would be excellent in Oman! We need them because our cars are like ovens when we get in them after they’re parked outside all day in 40-45 degree temperatures! Yes they would, Cathy – I’m surprised to hear you don’t have sunshades in car parks in Oman. Lots of big shopping centres have them here – or underground parking. People from down the Gib end of Spain are always driving up there, but I don’t know anyone in my Spanish pueblo who shops there. I had visions of it full of ex-pat northern Europeans until you said Spaniards actually do go there. When is the exhibition in Torre (and where)? I’ll try and get along if it combines with our Spanish time. And will you be there? There was a good mix of Spaniards in the store when I visited, including quite a few older people – which surprised me somewhat. I guess I’ll have to keep going back. That´s the thing – they are familiar, wherever they are! I wouldn’t mind an Ikea over here. But nooooo, we have to grin and bear it. Hmmmm, business oppertunity? Hey Marco, maybe you should drop them an email suggesting it! I think Ikea can be addictive, but fortunately for me, all I wanted to buy/bought were some photo frames. They all have to be similar for the exhibition, otherwise I would have been quite happy to recycle some I already have. I have a love-hate thing with IKEA. Mostly hate. But then I see how much of my house is furnished in it…sigh. AAwwww I know what you mean, Reg. Hey, clever use for the car park sun shades though, huh? AAWWWWW …. thank you so much, Sonel. An exhibition! How exciting, Marianne! Is this your first? Probably not because your photos are lovely. A few of my photos will be on display along with other (much more experienced) members of a Photography Group I have recently joined. I´ve been spurred on by people leaving such lovely comments about photos I´ve taken – so I decided to try to learn what to actually do! So do I, Gilly! I think the locals around Malaga were a bit bemused when it first opened a few years ago, but they flock there in their thousands now – just like everywhere else in the world. I love Ikea and I’m sat at my Ikea desk right now!